As Greater Vision embarks on their 25th year in gospel music, fans have come to expect a high level of quality in their music. Time and again, they meet those expectations, and they remain at the pinnacle of gospel music, with no descent in sight. As We Speak is the latest album from one of gospel music’s most acclaimed groups, another collection of meaningful songs with rich harmonies. The album opens with a blaze, an exciting Rodney Griffin-penned song that sounds like a slam-dunk number one hit. “Put Out the Fire” places us at the Jordan River with John the Baptist, proclaiming the coming of the Lamb of God. The lyrics relay the stirring implications of that name for Christ, who was the universal and perfect sacrifice for the sin of the world. What I didn’t realize until listening to the song and going back to the Scriptures, was that John’s proclamation was the first time recorded in the Bible that Jesus was referred to as the “Lamb of God”. What a striking statement that must have been to the Jews gathered around Jordan that day! “Put Out the Fire” lays it all out, and I haven’t stopped singing it for days. As We Speak contains a few other strong uptempo songs, and not all written by Griffin. 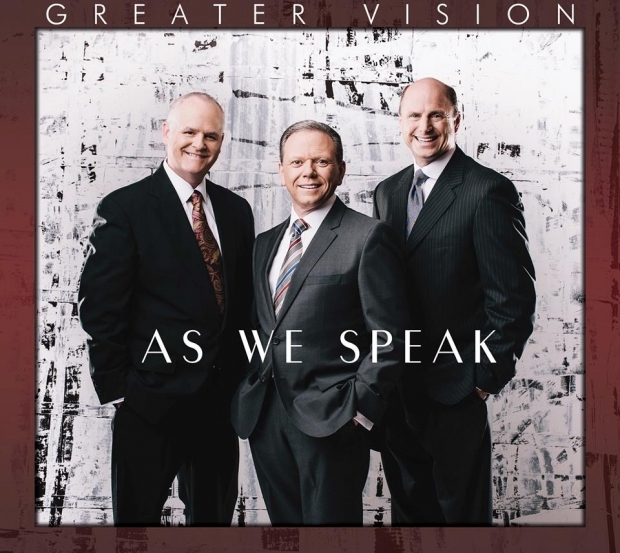 It’s been seven years since Greater Vision recorded a new song not written by Griffin or Chris Allman, but they picked out a good one with “Never Will I Ever Again,” from then pen of Regina Walden (whose “Oh Yes I Am” just went to #1 for the Kingsmen). A fiddle-laced country style number, it contains a catchy and slightly tongue-twisting lyric, the likes of which has been a Greater Vision hallmark over the years. Griffin’s “Toes in the Water” is a more hard-driving song with a practical message of commitment to God’s service. “The Sandals of Daniel” has a more easy-going sound and is another in a long line of Biblical narrative and self-examination lyrics from Griffin. Of course, Griffin’s not the only great songwriter in the group. Chris Allman’s songs, like “Another Child’s Coming Home” from The Only Way or “I Can Trust You” from For All He’s Done, tend to bring something a little different to the table musically for Greater Vision. Such is the case for “He Does,” a slower song with a gradual melodic lift that corresponds with a lyrical lift about Christ’s love for us. Allman teamed with Griffin to write “Saved by the Same Grace,” which tells the story of two seemingly opposite sinners, backed by by a B3 organ and electric guitar. As We Speak contains two more songs from “outside” the group. “We Can’t Tell It All” is the first new Phil Cross song Greater Vision has recorded in a decade. It is a mid-tempo number with a very strong country flavor and a simple lyric of God’s greatness, which is beyond description. The album’s one “old” song is a brilliant, even if obscure, pull from the Hemphills’ discography, “Let the Blood of Calvary Speak for Me”. What a lyric it contains, against an exquisite orchestrated backdrop by the late, great Lari Goss, who also co-wrote the song. Griffin turns in a great vocal feature on this one. He seems to be one of those singers who gets better with age, and in my opinion, he’s never sounded better than he does on As We Speak. I don’t think I’m the only one who notices, because he is featured on six of the album’s ten songs. Goss provided the orchestrations for the project prior to his passing earlier this year. Greater Vision paid a classy tribute to him on the album’s artwork, dedicating the recording to his memory. These arrangements on As We Speak are not the majestic and epic variety that is so well-associated with Goss, but the more understated and poignant type. One such example is “I Do Know,” a soothing song of heaven written by and featuring Griffin. The album’s closer and title song is its most moving, with a tender lyric expressing a desire for close fellowship with the Father. Much like “Seeking for Me” on the group’s last major recording, it is the sole feature for Gerald Wolfe. It is a tremendous, delicate vocal performance, one that I can see being a staple at the end of Greater Vision concerts this year. As We Speak doesn’t contain any memorable, high-flying vocals, or any dramatic power ballads with eight key changes. But that’s not why we listen to Greater Vision, is it?. It does contain what Greater Vision recordings always contain: substantive and Biblical lyrics, and musical excellence. Hearing their music is a constant reminder that the main thing is the quality of the song, and what the song is telling us. You will enjoy what these songs have to say, as they speak to us. “In The Sandals of Daniel” is the most relevant song Greater Vision has ever released, and quite possibly their all-around best song ever. It is an inspiring call to Christians to stand firm no matter how hostile their surrounding culture becomes to God. “I Do Know” is such an encouraging song to me. I keep playing it over and over. Praise God!